You are currently browsing the category archive for the ‘Fetus’ category. How does the physical growth of the fetal brain relate to pain function? Addressing this question is not just of research interest, but has profound consequences in guiding clinical use of analgesic and anesthetic intervention for in utero surgery. Adult brains appear structurally and functionally specialized for types of pain; for example, acute pain preferentially engages medial prefrontal cortical and subcortical limbic regions [1,2]. However, the question of the relationship between such specializations and pain is still controversial in the debate concerning fetal pain [3, for review]. One ‘maturational’ perspective is that brain growth and pain function co-develop through innate genetic and molecular mechanisms, and that postnatal experience merely has a role in the final ‘fine tuning’ [4,5,6,7]. Evidence concerning the differential neuroanatomical development of brain regions is used to determine a lower gestational age when particular regions likely become functional for pain. Several authors claim that maturation within subcortical brain regions enables pain function as early as 20 weeks gestation [6,7], others claim expansion of thalamocortical regions at 24 weeks is necessary and sufficient. An alternative ‘expertise’ view is that brain development and pain function involve a prolonged process of co-specialization that is shaped by postnatal experience [3,8,9,10]. Based on this approach, some authors argue that the fetal brain is not functional for pain at any gestational stage because skills such as sense of self and mind-reading learnt in postnatal life are necessary for pain [3,8,9,10]. Maturational views of functional brain development assume that brain growth and the appearance of functions are equivalent or the same thing, in the way that water and H2O are equivalent or the same thing, which implies that concerning the question of fetal pain, the sequential coming ‘on-line’ of specific brain regions during fetal development is identical with the appearance of pain function. That is, pain function numerically shares all its properties or qualities with the brain. Things with qualitative identity share properties, so things can be more or less qualitatively identical. Apples and oranges are qualitatively identical because they share the quality of being a fruit, but two apples have greater qualitative identity. Maturational views of fetal pain demand more than this, however, since they imply numerical identity. Numerical identity implies total qualitative identity, and can only hold between a thing and itself. This means that a maturational view of fetal pain makes a very strong demand about pain capacity: specific brain regions and pain function co-develop in the fetus because they are numerically identical, one and the very same thing. Pain is in the brain. 3. Pain is not numerically identical to the brain. 1. Pains are knowable to me by direct personal experience. 2. Brain events are not knowable to me by direct personal experience. 3. My pain is not numerically identical to my brain. 1. Ibuprofen is known by me to relieve pain. 2. Iso-butyl-propanoic-phenolic acid is not known by me to relieve pain. 3. Ibuprofen cannot be identical to iso-butyl-propanoic-phenolic acid. The premises in the example are true, but the conclusion is known to be false. The argument is fallacious because its core assumption – ‘fundamental divergence’ – is mistaken: it mistakenly assumes that a thing must be known by somebody somewhere. But the property ‘being known by somebody’ is not a necessary feature of anything, much less a property that might establish its identity or non-identity with something otherwise known. The truth of the premises may be due to nothing else but my ignorance of what turns out to be identical with what. This point entails that ‘being known by somebody’ is not a necessary feature of pain that might explain its identity or non-identity with the brain. The non-identity of fetal brain development and pain function cannot be established by this argument. The argument needs to produce independent evidence for the idea of ‘fundamental divergence’, since it is not self-evident. To illustrate this point, consider the argument for pain-brain numerical identity that personal pain would have no influence on mammalian behaviour were it not numerically identical with brain events . This apparently simple argument wasn’t established until fairly recently because a crucial premise was not available. This is the premise that physical effects like pain are determined by prior physical causes. This is an empirical premise, and one which scientific theories of pain didn’t take to be fully evidenced until the middle and late twentieth century [12, for review]. It is this evidential shift, and not the apparently obvious, which is responsible for the argument’s persuasive power. It remains to be seen if stronger evidence for pain-brain identity in the fetus is forthcoming. Of course, the failure of this particular argument to establish its conclusion does not thereby abolish the expertise perspective and self-guarantee its opposite, the maturational perspective, or even prove that the two perspectives are mutually exclusive. Rather, what the failure of the argument shows is that apparently obvious logic is sometimes a poor guide to reality. Whether pain-brain identity is true or false is impossible to tell simply by arguing personal appearances. Apkarian AV, Hashmi JA, Baliki MN. Pain and the brain: specificity and plasticity of the brain in clinical chronic pain. Pain 2011; 152(3 Suppl): S49–S64. Wager TD, Atlas LY, Lindquist MA, Roy M, Woo CW, Kross E. An fMRI-based neurologic signature of physical pain. New England Journal of Medicine 2013; 368(15): 1388–1397. Derbyshire SWG, Raja A. On the development of painful experience. Journal of Consciousness Studies 2011; 18: 9–10. Anand KJ, Hickey PR. Pain and its effects in the human neonate and fetus. New England Journal of Medicine 1987; 317(21): 1321–1329. Anand KJ. Consciousness, cortical function, and pain perception in nonverbal humans. Behavioral and Brain Sciences 2007; 30(1): 82–83. Lowery CL, Hardman MP, Manning N, Clancy B, Whit Hall R, Anand KJS. Neurodevelopmental changes of fetal pain. Seminars in Perinatology 2007; 31(5): 275–282. Brusseau RR, Mashour GA. Subcortical consciousness: Implications for fetal anesthesia and analgesia. Behavioral and Brain Sciences 2007; 30(01): 86–87. Derbyshire SWG. Controversy: Can fetuses feel pain? BMJ: British Medical Journal 2006; 332(7546): 909–912. Derbyshire SWG. Fetal analgesia: where are we now? Future Neurology 2012; 7(4): 367–369. Szawarski Z. Do fetuses feel pain? Probably no pain in the absence of “self”. BMJ: British Medical Journal 1996; 313(7060): 796–797. Papineau D. Thinking about consciousness. Oxford: Oxford University Press; 2002. Perl ER. Pain mechanisms: a commentary on concepts and issues. Progress in Neurobiology 2011; 94(1): 20–38. The trend in the literature on fetal pain is to approach the question of consciousness in the fetus in terms of conscious states of pain. That is, first define what makes a pain a conscious mental state, and then determine being a conscious fetus in terms of having such a state. Thus, the possibility of a conscious fetus is thought to rely on theories of conscious pain states. Call this the state approach to fetal pain. Two state approaches to fetal pain are present in the literature. One approach looks at the brain structure(s), pathways and circuits necessary for conscious pain states and then seeks to establish whether this substrate is present and functional in the fetus. There is broad agreement among researchers that the minimal necessary neural pathways for pain are in the human fetus by 24 weeks gestation [1, for review]. Some researchers argue that the fetus can feel pain earlier than 24 weeks because pain is enabled by subcortical brain structures [4,5,6]. Another phenomenal approach is to consider the subjective content of a conscious experience of pain, and to ask whether that content might be available to the fetus [1,2,3]. 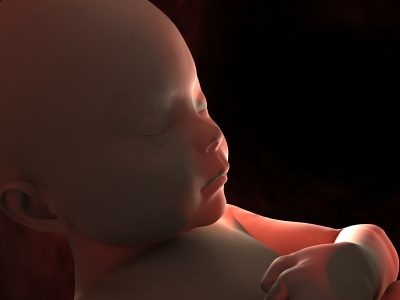 Based on this approach, some researchers argue that the fetus cannot feel pain at any stage because it lacks developmental abilities and concepts such as sense of self necessary for pain [1,2,3]. Although both state approaches are presented as opposites in the literature, they share the determination of fetal pain based on specific levels or degrees of complexity, whether of the brain structures and the relationship they have to the conscious state of pain, or of the subjective contents that constitute that state. An alternate approach to understanding fetal consciousness that has not been explored in the literature on fetal pain is the extent to which pain is based on the arrangement of certain brain structures (or experiential contents), rather than a result of maturation or increase in complexity achieved by growth of the brain substrate which below a certain size does not enable consciousness [7,8]. Thus, whether the fetus is excluded in this regard is not due to its simplicity, but because its lack of certain brain arrangements necessary to enable consciousness. The possibilities in this consciousness scale range from simply experienced sensation (‘This’; ‘This is so’) to self-consciousness (‘I am affected by this which is so’; ‘So this is I who am affected by this which is so’). Each stage in this scale presupposes consciousness. Any experience, whatever its degree of complexity, is conscious. It follows that to see, to hear, and to feel is to be conscious, irrespective of whether in addition a creature is self-conscious that it is seeing, hearing, and feeling . To feel pain is to be conscious of that experience regardless of whether in addition one is self-conscious of being in pain. Self-consciousness is just one of many contents of consciousness available to big-brained living creatures with complex capacities: it is not definitive of consciousness [7,8]. The point of saying this is that it circumvents the logical mistake of misidentifying attributes unique to a specialized form of consciousness (e.g., self-consciousness) as general features of consciousness itself. With this alternate view of consciousness now sketched in, we should determine where the fetus and where pain fall in the Indian scale of sentience. The possibilities in the scale extend from mere sensation to self-consciousness–where does the fetus fall in? Derbyshire S, Raja A. (2011). On the development of painful experience.Journal of Consciousness Studies, 18, 9–10. Derbyshire SW. (2006). Controversy: Can fetuses feel pain?. BMJ: British Medical Journal, 332(7546), 909. Szawarski Z. (1996). Do fetuses feel pain? Probably no pain in the absence of “self”. BMJ: British Medical Journal, 313(7060), 796–797. Anand KJ, Hickey PR. (1987). Pain and its effects in the human neonate and fetus. New England Journal of Medicine, 317(21), 1321–1329. Anand KJ. (2007). Consciousness, cortical function, and pain perception in nonverbal humans. Behavioral and Brain Sciences, 30(01), 82–83. Lowery CL, Hardman MP, Manning N, Clancy B, Whit Hall R, Anand KJS. (2007). Neurodevelopmental changes of fetal pain. In Seminars in perinatology (Vol. 31, No. 5, pp. 275–282). Merker B. (1997). The common denominator of conscious states: Implications for the biology of consciousness. Available at: http://cogprints.soton.ac.uk. for neuroscience and medicine. Target article with peer commentary and author’s response. Behavioral and Brain Sciences, 30, 63–134. There is broad agreement among researchers that the minimal necessary neural pathways for pain are in the human fetus by 24 weeks gestation [1, for review]. However, some argue that the fetus can feel pain earlier than 24 weeks because pain can be enabled by subcortical brain structures [2,3,4,5]. Other researchers argue that the fetus cannot feel pain at any stage of gestation because the fetus is sustained in a state of unconsciousness . Finally, others argue that the fetus cannot feel pain at any stage because the fetus lacks the conceptual postnatal development necessary for pain [7,8,9]. If a behavioral and neural reaction to a noxious stimulus is considered sufficient for pain then pain is possible from 24 weeks and probably much earlier. If a conceptual subjectivity is considered necessary for pain, however, then pain is not possible at any gestational age. According to , much of the disagreement concerning fetal pain rests on the understanding of key terms such as ‘wakefulness’, ‘conscious’ and ‘pain’. 1. Pain experiences are subjective. 2. Brain events are objective. 3. Pain experiences are not identical to brain events. 1. Pain experiences are knowable to me by introspection. 2. Brain events are not knowable to me by introspection. 3. My pain experiences are not identical to any of my brain events. 1. Ibuprofen is known to me to relieve pain. The premises in the example are true, but the conclusion is known to be false. The argument is fallacious because the core idea of the argument – ‘fundamental divergence’ – makes an erroneous assumption; namely, it assumes that a thing must be known by somebody. But the property ‘being known by somebody’ is not a necessary feature of any thing, much less a property that might establish its identity or non-identity with some thing otherwise known. The truth of the premises may be due to nothing else but my ignorance of what turns out to be identical with what. These considerations challenge the assumed epistemology in the conceptual subjectivity view of pain. They also challenge the related claim made by proponents of conceptual subjectivity that any description of a pain given in objective scientific terms will necessarily always exclude the personal experience of that pain [7,8,9]. The argument made here is by now familiar: since descriptions of pain in personal subjective terms are different from scientific descriptions of pain, it follows that a pain and its private subjectivity cannot be identical with a brain event and its public objectivity. Only persons can feel pain – brain cells and protein channels can’t. Clearly, the argument begs the issue in question: whether or not the subjective features of a pain I personally experience are identical with some objective features of my brain that might be discovered by neuroscience is precisely the question at issue [10,11]. Besides, in order to understand a scientific explanation of pain, neuroscience does not require of a person that he both understands the explanation and feels pain as a condition of understanding. Neuroscience aims to explain pain, that is its main purpose. Too much is demanded of neuroscience if, in addition to formulating an explanation of pain, it is meant to re-create pain in somebody as a requirement of understanding [10,11]. This expectation is therefore much too strong. Derbyshire SWG, Raja A. (2011). On the development of painful experience.Journal of Consciousness Studies, 18, 9–10. Anand KJ. (2007). Consciousness, cortical function, and pain perception in nonverbal humans. Behavioral and Brain Sciences, 30(1), 82–83. Lowery CL, Hardman MP, Manning N, Clancy B, Whit Hall R, Anand KJS. (2007). Neurodevelopmental changes of fetal pain. In Seminars in perinatology, 31(5), 275–282. Mellor DJ, Diesch TJ, Gunn AJ, Bennet L. (2005). The importance of ‘awareness’ for understanding fetal pain. Brain research reviews, 49(3), 455-471. Derbyshire SWG. (2012). Fetal analgesia: where are we now? Future Neurology, 7(4), 367-369. Derbyshire SWG. (2006). Controversy: Can fetuses feel pain? BMJ: British Medical Journal, 332(7546), 909. Churchland PS. (2002). Brain-wise: V: Studies in Neurophilosophy. MIT press. van Rysewyk S. (2013). Pain is Mechanism. PhD Dissertation, University of Tasmania.